Leading clinicians and scientists in solid organ transplantation review the current status of the field and describe cutting-edge techniques for detecting the immune response to the allografted organ. The authors present the latest techniques for HLA typing, detecting HLA antibodies, and monitoring T-cell response, and examine more specialized methods utilizing proteomics, laser dissection microscopy, and real-time polymerase chain reaction. 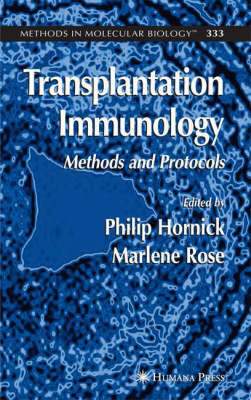 The area of tolerance induction and reprogramming of the immune system is also covered, along with a discussion of up-to-date methods of organ preservation, of today's optimal immunosuppressive drug regimens, as well as the difficulty of mimicking chronic rejection in experimental models. Introductory chapters provide a theoretical update on current practices in renal, liver, islet, and lung transplantation and on the pathways of antigen presentation and chronic rejection.